Even though pesto started showing up on menus, and recipes for it popped up in cooking magazines as early as the 1980s, many people still ask themselves - frequently silently to avoid appearing culinarily challenged - what is pesto? The basic definition is simple but the variations on the theme are complex. 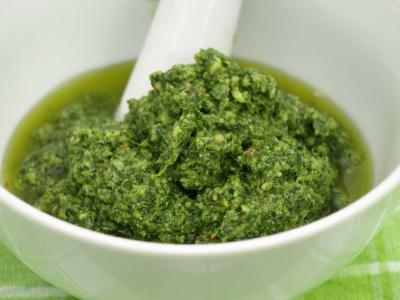 Pesto is an Italian sauce traceable back to Genoa, a city in Northern Italy. The word is a derivation of the word pesta, which means to pound or crush. The original pesto was comprised of crushed garlic and herbs, usually mixed with olive oil to give it a saucy consistency. The word pestle, the wooden tool used to mash foods in a marble bowl called a mortar, has the same etymological roots. A mortar and pestle were the tools traditionally used to make pesto before the invention of the food processor. Old Italian cookbooks usually include a version of the original Genoese pesto recipe that commonly includes only five main ingredients. Gently roast the nuts in a heavy skillet, preferably cast iron, on top of the stove until they just start to change color and emit a toasty fragrance. Watch the nuts closely as they can turn from roasted to burnt in just few seconds. In the bowl of a food processor fitted with a metal blade, place the basil leaves and nuts. Pulse several times to chop. Add the garlic and pulse several more times until thoroughly mixed with the other ingredients. With the processor running, slowly pour in the olive oil in a steady stream, occasionally halting the process to scrape down the sides of the bowl with a nylon or rubber spatula. Sprinkle the grated cheese into the processor bowl and process with pulses until well mixed. Taste the pesto and add salt and pepper to taste. Makes about one cup of pesto. The earliest pesto recipes included only the most traditional Italian ingredients. As the concept emerged in modern kitchens, cooks took the liberty to mix and match assorted food components to create different flavors. Depending on personal tastes and what is available at the market, pesto ingredients are variable. Instead of basil, use fresh spinach leaves as a good substitute, or try flat leaf Italian parsley or cilantro. Interesting tastes evolve by mixing and matching different leafy herbs and vegetables in the sauce. Just like pesto greens, the type of nuts used is optional and can create interesting sauces. Instead of pine nuts or walnuts, substitute almonds, cashews, hazelnuts or pecans. To maximize their flavor, lightly toast and roast them beforehand. Asiago or any hard, dry cheese is acceptable to make pesto. Softer cheeses are inappropriate as they will make the sauce gummy and sticky. Although extra virgin olive oil is frequently used to bind pesto ingredients based on its light, unobtrusive flavor, flavored oils are interesting options. Walnut oil adds richness to pesto sauces and fruit infused oils like raspberry, peach and strawberry varieties add an interesting taste. Use flavored oils sparingly to avoid overpowering the other pesto ingredients. Roasted red peppers or oil-packed sun-dried tomatoes pair well with the garlic, herbs and cheese in pesto sauces. Precook any vegetable additives to ensure full incorporation with the other ingredients and produce a smooth sauce. Pesto is traditionally served as a pasta sauce but is equally delicious as a grilled vegetable topping, pizza ingredient or smeared on toasted bread as an appetizer. It keeps for about a week in the refrigerator or can be frozen for several months. In either case, float a small amount of olive oil on the surface of the pesto to prevent discoloration of the greens. The next time someone queries, "What is pesto?" you can now give the inquirer a brief history of the sauce as well as recipe variations and preparation tips. In the meantime, experiment with ingredients and additives to create more pesto alternatives.